An enormously long jetty stands in the harbor alongside the Eastern Point Lighthouse in Gloucester, MA. Named the Dog Bar Breakwater, this absolutely frigging enormous structure took nine years to build and was completed in 1905. Thanks to the rough waters of the Atlantic Ocean, even after the lighthouse was built ships still ran aground at Dog Bar Reef. 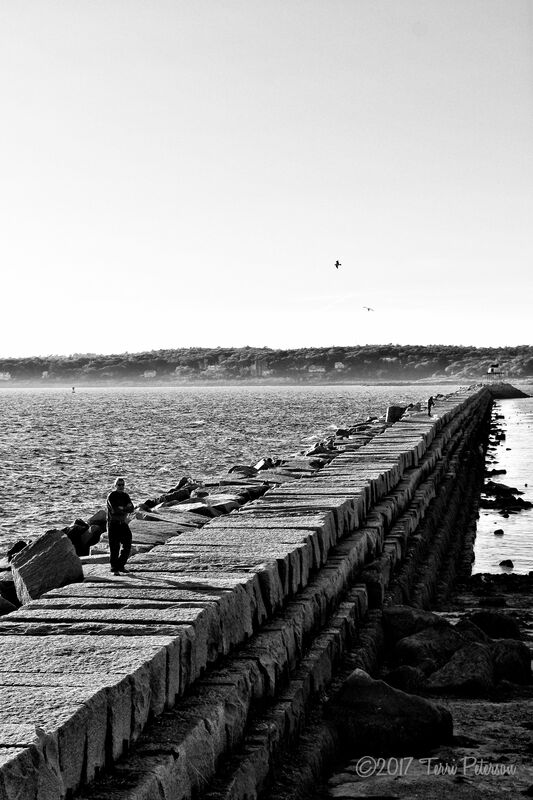 To attempt to calm the harbor and give ships a safe place, particularly when the ocean inevitably grows angry, the Army Corps of Engineers built the breakwater–all 2,250 feet of it–using 231,760 tons of mostly local granite. If you’re going to build anything that can stand up to an ocean storm and protect an inner harbor, you might as well do it with 463,520,000 pounds of rock. Plus, it looks cool. And it’s fun to walk on a bright, sunny day (only, mind the bird poo!). Yes, we walked the whole thing.